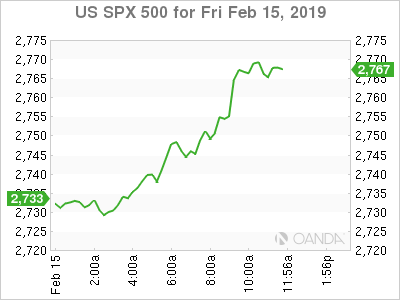 The greenback and U.S. stocks are poised for another weekly gain as trade talk progress appears to be gaining momentum, with negotiations continuing next week in Washington. Financial markets in the short-term are relieved the government will be funded, despite a legal dispute on emergency powers, and expectations are high we will not see an escalation in trade tariffs as China and the U.S. appear close to reaching a memorandum of understanding. Dollar traders may have overreacted after yesterday’s shocking headline of December falling the most since 2009. The greenback sunk heavily as concerns rose that the U.S. is not on sound footing. Today’s economic data painted a mix picture as the reading rebounded better than expected but both industrial production and factory output decreased more than expected. Economic data for the U.S. is likely to remain volatile and mixed in the first quarter, but so far does not derail the base case for the U.S. post near 2% economic growth in 2019. 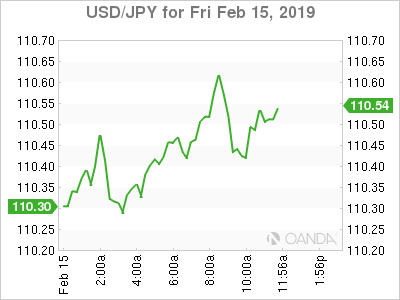 USD/JPY for Feb. 15, 2019. The political situation in Spain remains dicey as we will see another election, the third in four years, with the potential outcome of seeing another minority government formed, leading one to believe Spain may not be able to implement strong initiatives going forward. Prime Minister Sanchez called for snap elections on April 28, just ahead of the European Parliament elections that will be held in late May. In early polls, Sanchez’s Socialists appear to have a slight lead over the conservative People’s Party. The market reaction is somewhat limited to the Spanish elections as stronger economic success from Madrid has kept yields stable on Spanish bonds, the 10-year yield remains near 2-year lows. 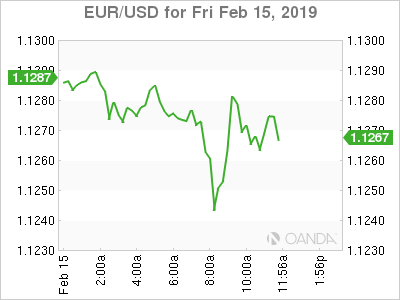 EUR/USD for Feb. 15, 2019. Amazon remained the key story on Wall Street as the decision to cancel plans to build a second headquarter in Long Island City, N.Y., sparked a political debate that will likely become a key campaign issue for 2020. Amazon decided that the $3 billion in subsidies might not be enough to outweigh the rising concerns from state and local politicians. Local leaders felt Amazon got too much in subsidies, feared the rising cost of living and strains to the infrastructure system was to do more damage to the existing community. The loss of 25,000 Amazon jobs, 1,300 construction jobs and several thousand in direct and indirect jobs will be missed, but not nearly as much as the $27 billion in tax revenue New York would have seen in over the next couple of decades. Amazon stock did not have a major reaction, but the decision could eventually be positive for the stock. Amazon was set on reinvesting this year and while they will miss out on a key objective of establishing a major east coast office, they will likely be able redirect the funds set aside for the N.Y. headquarters on acquisitions, build their existing offices and continue recruiting top talent. US S&P 500 for Feb. 15, 2019. Gold’s refusal to break below $1,300 despite significant progress and optimism signals that the market may be focused on the slowdown that is developing in the U.S. A softer U.S. economy could further cement a dovish Fed, which could help the yellow metal resume its’ recent rebound. Economic data from the U.S. continues to remain soft, Empire Manufacturing beat expectations, but is well off the levels it enjoyed in 2018 and Industrial Production and Factory output continued to show weakness. Momentum traders may be on the sidelines and waiting to see if gold is eventually able to take out the 2019 high of $1,331. 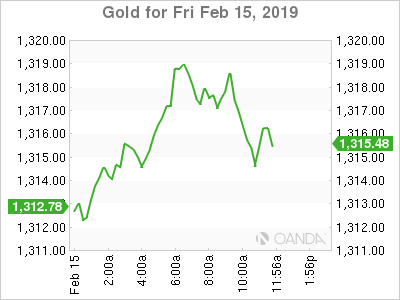 Gold for Feb. 15, 2019. Crude prices benefited from positive developments on the trade front. For most of the week oil’s gains were capped as OPEC’s reduction efforts appear to be running out of steam. The supply side argument has dominated headlines, with U.S. production likely to be the dominant theme for years, but if we see a significant memorandum of understanding in the China-U.S. trade war that includes progress on technology transfer, IP protection, non-tariff barriers, and better trade terms, we could see oil remain bid on improving demand as global growth concerns would ease rapidly. 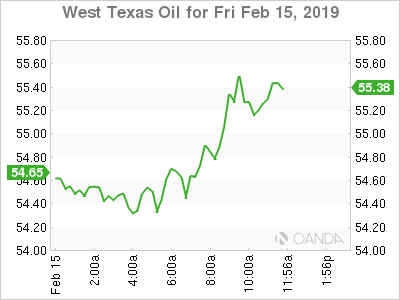 WTI for Feb. 15, 2019.